A material they carry is called Wet Felt and comes in a 36″ x 36″ roll. This felt material can be cut in sections and shaped to your desired form. At this point you can let it air dry, or oven dry at 350 degrees until the form is hardened about 4 hours. It is still too rough to apply enamels on but if you layer on their fiber coat, as many times as it takes to create a even surface, then you can sand it to get a very nice smooth surface. Apply kiln wash and after all is dry, place plique a jour form on the felt form and enamel away! 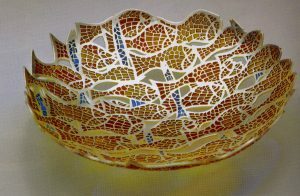 I believe the materials are most helpful in creating larger forms such as vessels. Be sure to wear protection mask while sanding. And one draw back I found is that he shelf life of the fiber coat is short. So make yourself a note to shake it up often and when mine got too thick I added water. Fusion Headquarters does not have the Fiber Coat on their site due to the short shelf life = 6 months, and the expense. If you call they will have it for you in a couple of days.